Web browsing is an obvious stress test for battery life, but what about checking your email throughout the day? In our iPhone review we found that the Blackberry Curve can last over a full 24 hours, all while constantly checking email. Neither the Samsung Blackjack or the iPhone came anywhere close, but it's still a valid test for battery life using these various connections. For this review we went with a much lighter email load test than what was used in our iPhone review. Both phones were setup to automatically check a gmail account every 15 minutes, downloading 10 - 15 emails each time. The phones were completely idle during the 15 minutes in between checks, although the screens remained turned on throughout the entire test. 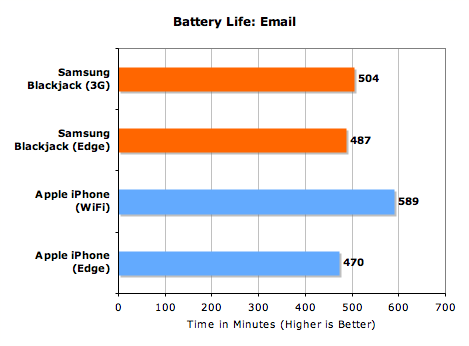 On 3G the Blackjack lasted slightly longer than on EDGE, but we're only talking about a 3.5% difference which is within the margin of error for this test, meaning that battery life on 3G vs. EDGE is basically identical. This test is particularly important as it shows that if your usage is dominated by extensive periods of idle time, then there's no negative impact to 3G vs. EDGE. Another way of looking at it is that if all you're doing is short bursts of data traffic, the negative impact of 3G is minimized. The same can't be said about Wi-Fi vs. EDGE on the iPhone where there's about a 25% increase in battery life when we ran the test over Wi-Fi instead of EDGE; the difference is identical to what we saw in the web browsing test. It appears that maintaining the Wi-Fi connection and using it to periodically check for email is significantly more power efficient than doing so over EDGE, despite the reduction in data traffic compared to our web browsing test. It seems to be that how much data you send isn't the only limiting factor, but rather just polling for new data is much more power efficient over Wi-Fi.